Size of this preview: 400 × 600 pixels. Other resolutions: 160 × 240 pixels | 320 × 480 pixels | 732 × 1,098 pixels. This panel, which comes from a nave chapel (fifth to the left) in the church of Santa Maria in Vado in Ferrara, was removed to Rome after the devolution of the Duchy of Ferrara to the domains of the papacy in 1598. In the same group of paintings transported from Ferrara to Rome were the Deposition by Ortolano, now in the Galleria Borghese, and the altarpiece with the Madonna, St Anthony the Abbot and St Cecilia, now in the National Gallery at Palazzo Barberini. By 1612, the work had already been replaced by a copy commissioned to fill its place in the chapel. The original later entered into the celebrated collection of Cardinal Flavio Chigi. Vasari, who describes Garofolo's Ascension in his writings, considered it to be a fundamental work of this Ferrarese painter, who was closely connected to the church for which the painting was intended. 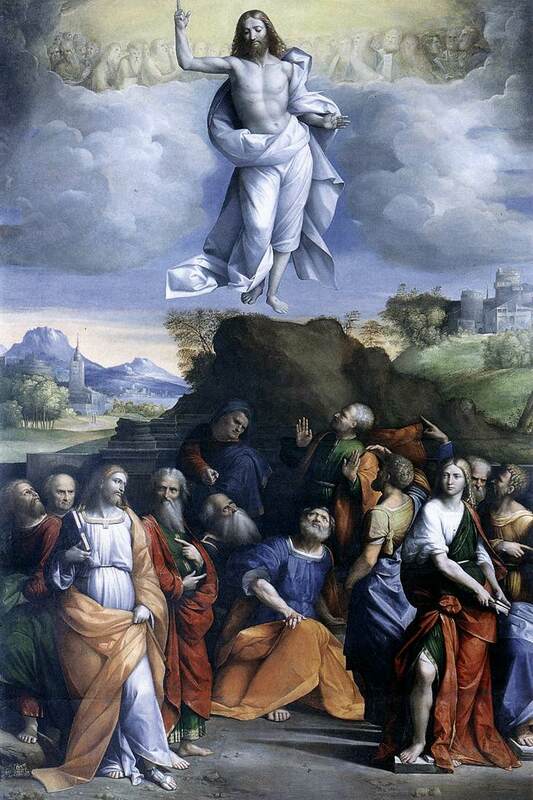 Raphaelesque influences are evident here, especially when one compares Garofolo's work to Raphael's Transfiguration. Strong similarities exist between this work and other paintings by Garofalo dating to 1519-20, such as the 1520 Resurrection in the Archpretal church of Bondeno, and the 1519 Massacre of the Innocents. This page was last edited on 22 April 2019, at 15:17.